Cover pencils by Curt Swan, inks by Murphy Anderson. "The Immortal Superman! 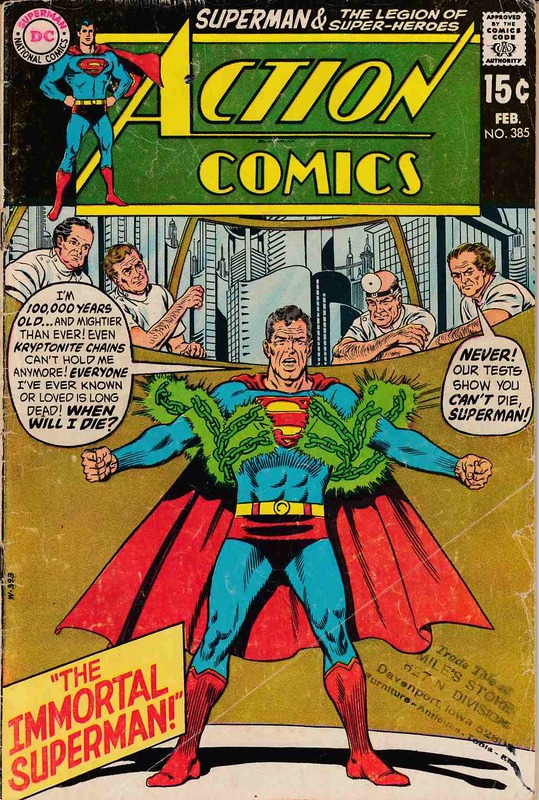 ", script by Cary Bates, pencils by Curt Swan, inks by George Roussos; After promising the President not to travel through the time-barrier using his powers, Superman must use a defective Legion time bubble to answer a call for help from the future; When he arrives in the year 101970 he finds that he has aged a hundred thousand years. Tales of the Legion of Super-Heroes back-up, "The Fallen Starboy! ", script by E. Nelson Bridwell, pencils by Win Mortimer, inks by Jack Abel; Star Boy leads a mission to his home planet and faces the brother of Kenz Nuhor, the man he once killed in self-defense. *Grading Notes: several large store stamps on covers and interior pages, spine split (1") at top of spine. small tears along spine.